What is this term "palliative chemotherapy"? Are the words "palliative" and "chemotherapy" so incompatible that their combination is an oxymoron? Is this term a useful term? Who is it useful for? Doctors? Patients? Researchers? We got talking about this in our palliative care journal club this month as we discussed an outstanding recent study by Alexi Wright published in the BMJ. The study investigates the association between receipt of "palliative chemotherapy" and place of death for adults with advanced cancer. The study finds there is an association, and this finding raises all sorts of interesting points about how we might explain chemotherapy to patients who are months away from death. See Mike Rabow's terrific commentary here. We've blogged before about how in the United Kingdom they prioritize honoring a patient's "preferred place of death" in the same way we prioritize honoring code status in the US. (Perhaps this is why the paper was published in the British Medical Journal.) But preferred place of death is not the focus of this blog post. You see, this study enrolled patients with advanced cancer and a physician estimated prognosis of 6 months or less and whose cancer had progressed through at least one chemotherapy regimen. Those who were receiving further chemotherapy at the time of study enrollment were deemed to be receiving "palliative chemotherapy." Patients who received "palliative chemotherapy" lived a median of 4 months from study enrollment. So, in our journal club we wondered, what is "palliative chemotherapy?" We had a strong suspicion that reasonable people might disagree about what this term means. "Palliative chemotherapy is defined as treatment in circumstances where the impact of intervention is insufficient to result in major survival advantage, but does affect improvement in terms of tumor-related symptoms, and where the palliation/toxicity trade-off from treatment clearly favors symptom relief." But here is the question - do you think these patient's believed the chemotherapy they received was given to treat symptoms? Or did they believe they were receiving chemotherapy to survive longer? How do you think these patient's oncologists explained chemotherapy to these patients? Did they use the words "palliative chemotherapy?" Should they have used the term? This is a fascinating issue on several fronts. First, oncologists sometimes offer treatments to dying patients because they don't know what else to offer, and don't want to abandon them, even if they don't believe the treatments will work. Diane Meier recently wrote a remarkable moving story about just such an experience from the perspective of the palliative care doctor for the journal Health Affairs. All chemotherapy given to patients near the end of life is not "palliative" - directed at symptoms not survival. Oncologists sometimes are trying to pull one more rabbit out of their hat and help patient's live longer. And sometimes it works! But the risks of chemotherapy are real, and as Alexi Wright's study elegantly shows, may have implications for the end of life months later. Sometimes the chemotherapy doesn't work. Sometimes it results in less engagement with advance care planning. Sometime people end up dying in the hospital or the ICU rather than at home, as they would have preferred. The decision to "try" another chemotherapy months before death may lead to a trajectory of care that places the patient at odds with the goal of symptom relief. Second, I worry that by labeling the treatment "palliative" some oncologist feel better about offering and administering chemotherapy to patients with advanced cancer. As if the term palliative is permissive, in some sense. But just calling it palliative doesn't make it ok. Sometimes chemotherapy is appropriate and in line with patient's goals. And sometimes it just isn't. Third, we should not confuse the timing of the chemotherapy in relation to death with the intention of the chemotherapy. Many of these patients likely believed the chemotherapy was intended to prolong life, or even curative in intent. Jane Weeks last great publication highlighted this issue clearly, as we blogged about previously (Weeks was a co-author on the Wright study). 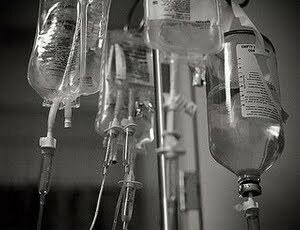 Not all chemotherapy given near the end of life is symptom directed or "palliative" in intent, as understood by the doctor, or the patient. Finally, there is enough confusion about the term palliative already. Do we really want to add to the confusion by linking palliative care with chemotherapy? I suspect that no matter how clearly the doctor explains that the chemotherapy is for symptom relief not survival, when most people hear the word "chemotherapy" and they think "cure" or at least "live longer." This is akin to the problem with having all these precancerous states called "cancer" - think early stage prostate cancer or ductal carcinoma in situ. When people here these terms, they think "cancer=death, must get cancer out." Risks of treatments and likelihood of harm from cancer be damned. Linking the terms "palliative" with "chemotherapy" probably doesn't make sense to patients. They probably don't know what palliative means, anyway. I think the term "palliative chemotherapy" is misused by doctors and confusing to patients. It muddies the waters of what "palliative" means. This is our brand, people. The brand is everything. Palliative care is not all things. We shouldn't use the term "palliative chemotherapy." Instead we should say specifically what the chemotherapy is used for: "chemotherapy for symptom relief," "chemotherapy to prolong life," or "chemotherapy to cure." I agree that Palliative chemo is term that should not be used. The question is how. No one owns the word. It is already in fairly wide use. It's going to be a long, uphill struggle to remove the phrase for oncology conversations. I defy you to name one treatment intervention that is not palliative, other than antibiotics for acute infection, and perhaps certain surgical conditions such as cholecystitis or appendicitis, all acute nonetheless. Why don't we call it "palliative bypass" surgery when a revascularization procedure is performed for ischemic heart disease? It fits the definition of palliative; to relieve without curing. Help me with my thinking on this. Isn't almost every medical intervention directed at remittive therapy and amelioration of the effects of some chronic condition resulting in disordered biology? I for one, am no longer a palliative care doctor! I have changed my specialty designation to 'patient centered care specialist'. Let's just scrap the term palliative altogether, because it's all palliative, baybee! sir, the answer to ypur query is in your words itself. provide symptom relief and improve the quality of life, what else is palliative care? In Rheumatology, they have treatment called DMARDs, disease-modifying anti-rheumatological drugs. (say: d-mard.) I call chemo and radiation "disease-modifying" therapies. You could use an acronym, Disease-modifying anti-neoplasm drugs: DMAND. (say: d-mand.) but it's faster just to say "disease-modifying therapies". Palliative implies that the patient feels better. So for example, preventative care by definition is not palliative. Mammograms, Dexa's, colonoscopies are not palliative. Disease modifying therapies are often not palliative such as tight vs loose control of Dm2, Htn, hyperlipidemia. No one has ever felt bad for having an LDL of 190. Treatment of asymptomatic CAD is not palliative either. To put it in simple terms, it's hard to make a patient who feels fine, feel even better. In that sense, dialysis is not often a palliative intervention. People trade QOL for longevity. The amusing thing about the above examples is that antibiotics for an infection could be palliative, surgery for an acute appendicitis could be palliative and fixing a hip surgically could be palliative as well. Palliative is not a euphemism for non curative care. It is meant to communicate that the patient will feel better. Often times the treatment is called Palliative Chemo so that Hospice will consider paying for it. In my experience "palliative chemo" is non curative. I think it should be renamed "life prolonging chemo"
Palliative is an adjective that should be used only to describe the actual outcome achieved of an intervention. This will allow decision making between patients and physicians to be honest. No switch and bait. No euphemisms. No categorization based on intent or wishful thinking or theoretical design or animal models or financial structures or emotional purpose. Renaming non curative chemo as life prolonging chemo is another switch and bait euphemism. It should only be called life prolonging if it is shown to prolong life. Outcomes. Eric: one day I'll have to finish my lit review on palliative chemo. Get this.....I have Stage IV, Nasopharengeal carcinoma widespread to the bone. I've had one round of chemotherapy (6 treatments), neck surgery (40 lymph nodes removed), and because of headaches, vomiting, hearing impairment, sore teeth, and fatigue, I was given a choice of "palliative radiiation" (4,000 Gy's), or go for a 'permanet cure" (7,000 Gy's). Yes! a "permanent cure," was the language used by the oncologist if I chose the 7,000 Gy's........well, I chose the "palliative radiation" dose, as i know there is no "cure" for me. He was not the only oncologist who used the word "cure" in his discussions with me. I feel disrespected and nearly pushed into greater toxins and side effects that I do not need. The symptoms have gone away (4,000 worked for now), and my quality of life is at an all time high -- living with cancer I have discovered is much better than spending all my time fighting it (with extreme side effects as a resullt -- the result is not quality, but rather quantity (a very small quantity). Who in the world is training oncologists? Thank you, Dr. Uy for the shout-out to surgeons. The term "palliative care" was first introduced by a surgeon (Mount). As a surgical oncologist, I am THRILLED to see other like-minded palliative care providers interested in taking back our name and not branding treatments as palliative when they are, in fact, not directed or intended toward symptom improvement or improved quality of life. While one might argue that living longer is a quality of life outcome, I think many of us know that longer is not always better. I wholeheartedly encourage using more precise language so patients, families, and providers are clear about the intent of our interventions--be if chemo, surgical resection of a tumor, re-vascularization procedures. So, where do we go from here? How do we get this message out? David Oliver - Terrible! And it should be shocking. But the fact that your oncologist was using the phrase "curative" for a non-curative cancer is not terribly surprising. The misuse of language here applies not just to "palliative" but also to "curative." Bridget Fahy - I'm not sure how to start a movement. My guess is that change should come from within. In the twitter feed I noticed people from the American Society of Clinical Oncology ASCO started tweeting about it. A step in the right direction. I have another complaint about the word palliative chemo. I was asked as medical director of a hospice to approve palliative chemo for a young woman with uterine cancer. The oncologist called it agressive and life prolonging as did the patient. The referring doctor called it palliative so hospice would take the patient and pay for the chemo as he was the medical director of the HMO that was at risk. I declined so he went to another hospice. There is obviously a huge amount of confusion abou how to define "palliative," even in THIS community! "Palliative" comes from the word "to cover over." Something palliative therefore makes symptoms better WITHOUT fixing the underlying problem. So, if you accept that definition, disease-modifying treatments are not palliative, even if they help someone feel better. So an appendectomy and antibiotics are NOT palliative, since they alter the underlying course. If you define palliative as simply "feeling" better" as some above do, then almost any effective chemotherapy IS palliative, since the best way to get rid of cancer symptoms is to shrink the cancer! By the more traditional definition, almost NO chemotherapy is palliative. So while antibiotics, chemo, and disease-oriented treatments are not palliative, treating a cold, low back pain, and any therapies for pain or symptom relief are palliative. Procedures that relieve local cancer symptoms such as stents and some radiation could be considered palliative.